We wake at 7 ish and the Disney Dream is already in port. We have breakfast in the room and pack up. Check out at 10am and drive to the port. We drop off the checked bags and then park in the multi storey car park, which will cost $75 for the duration. 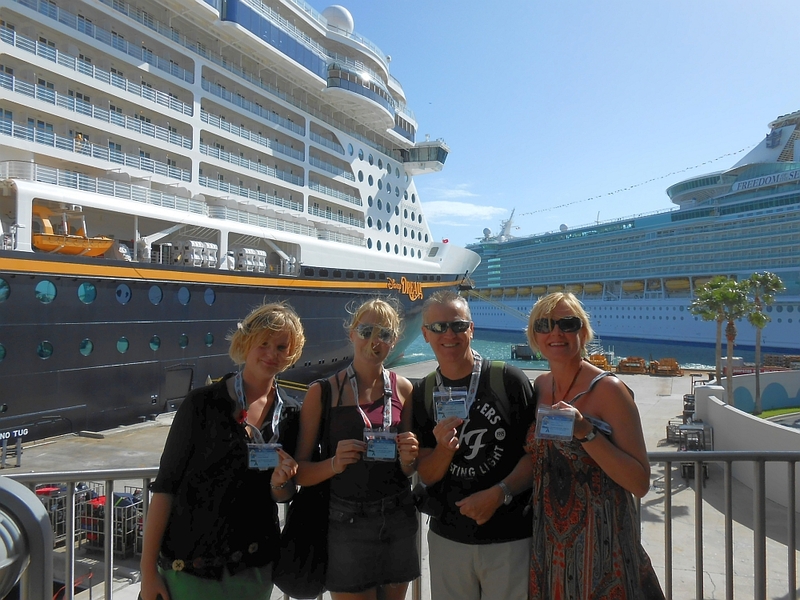 We join the line on the sky-lane to queue for embarkation  we booked the first check in for 11am. We go to the non-US line and check in very quickly and are given number 3. At 11.30am our number is called and we proceed to the entrance. 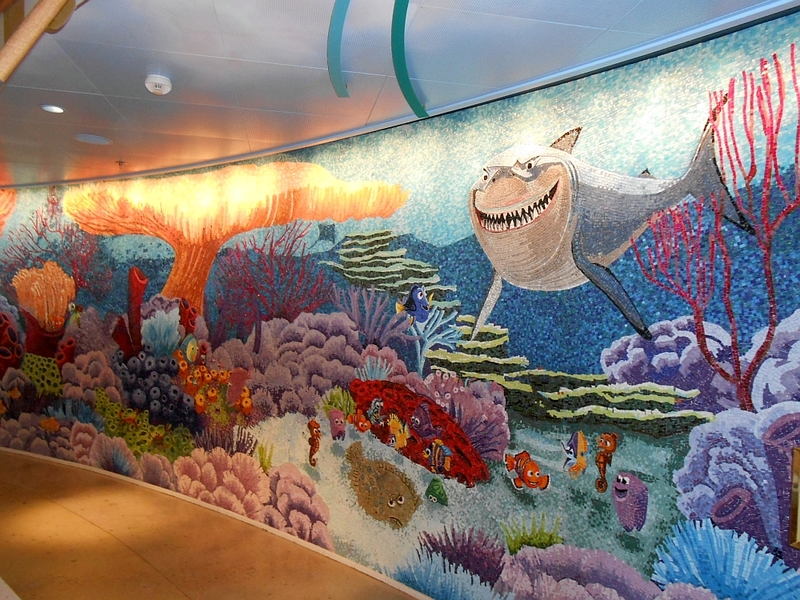 It is always such a thrill to get the Welcome aboard the Stringer family as you enter the beautiful lobby. 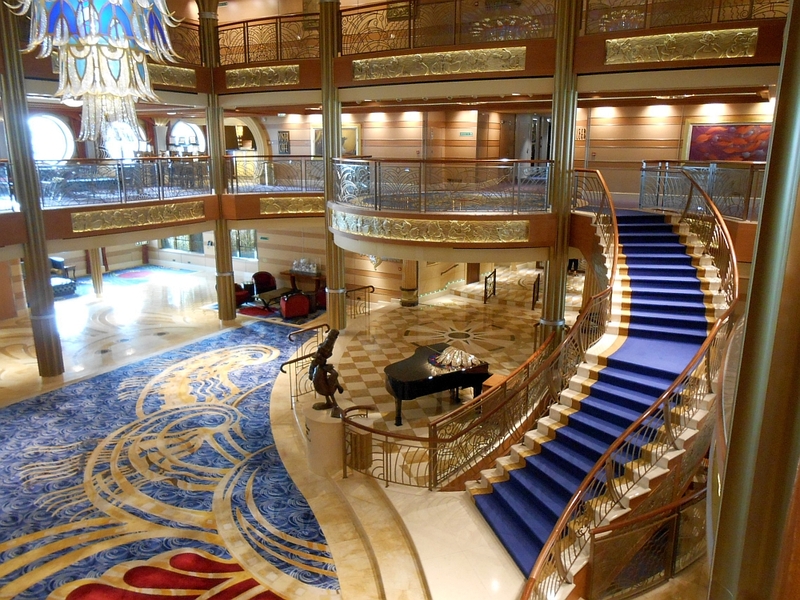 It is our first time on the Dream and she certainly doesnt disappoint  the features are beautiful  from the sweeping staircase, beautiful chandelier, colourful carpets and grand piano to the bronze statue of Admiral Donald Duck. We go straight to guest services where we enquire about the Mixology Class. Luckily they confirm that Georgia can watch  we had read conflicting reports on whether under 21s could attend. So we sign up for tomorrow afternoon at 4pm  which is the day we stop in Nassau  the cost is $15 each. We also ask about the Rainforest Room day pass that we had read about. 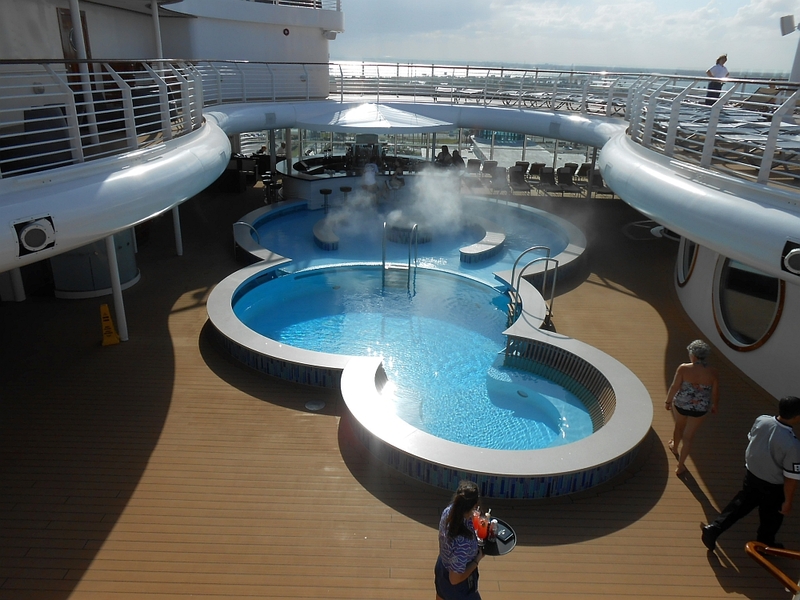 We were told we would need to go to the Spa to find out whether this is being offered this cruise. The Spa is beautiful  we are told we can do a day pass for $16 each and if you want a scrub it is an additional $9. I read that the scrubs were lovely and decided to get one as we could all share it. There was a choice of scents  lavender, chocolate and mint, tangerine and vanilla orange. I chose the vanilla and orange and wasnt disappointed as it really was a wonderful smell  you are given a small loofah in the kit to help apply it in the showers. We were given a tour of the Spa and all the different rooms and treatments available. All I can say is - wow! If money was no object I would be in there every day sampling every treatment going. We had decided that our best chance to ride the Aquaduck would be on embarkation day nice and early - so we go up on deck and change into our costumes. The girls go first as it is 2 per raft  Kev and I stay with our stuff and video them  then it is our time. 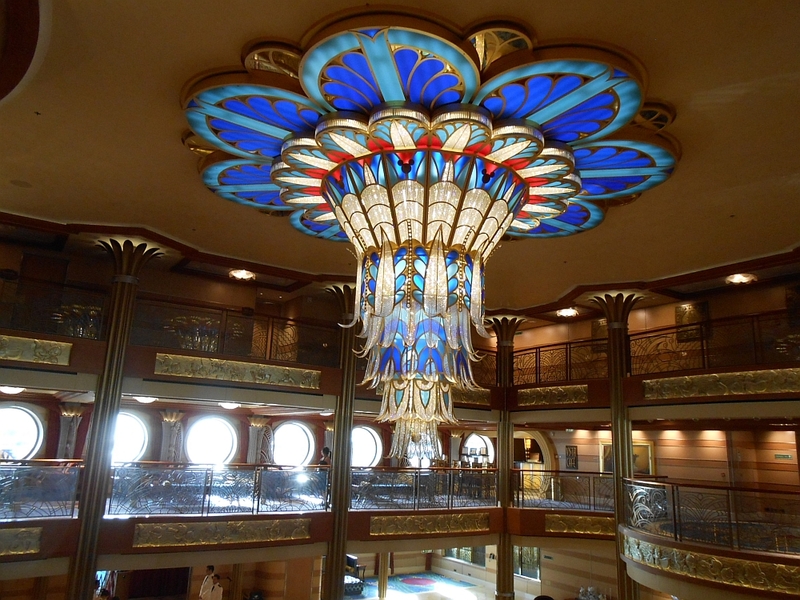 It was so much fun  the view looking down at the ship was great and it was a really different thing to do  I loved the fact part of the ride goes over the side of the ship. My only regret is that for the rest of the cruise it was so busy it would have meant queuing to ride again and so we only did it the once. We dry off in the sun and then go to The Enchanted Garden Restaurant for the buffet lunch. 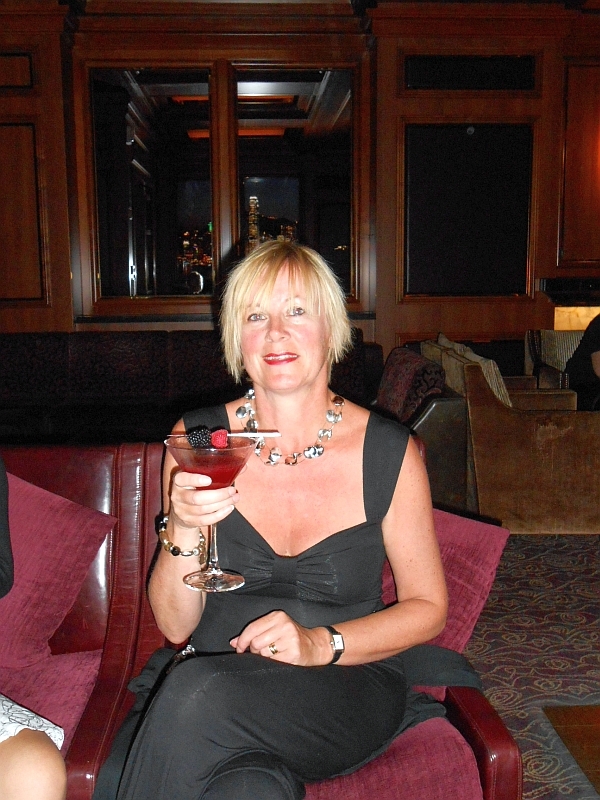 There was a great choice  I particularly enjoyed the gorgeous cheese mash with beef, horseradish and gravy. But I also tried some crabs legs and some salads. The choice of puddings and ice creams wasnt as inspiring as I had hoped but it was tasty enough and a good end to the meal. The staterooms were now ready  we had cabins 8000 and 8002 which were category 9A on deck 8 which were interconnecting at the front of the ship with slanted port holes  meaning they were very light and we could see the bow of the ship. Kev had done some research and discovered that these are larger than other rooms in the category due to the position with the slanting front wall. The only disadvantage for some might be that they are quite a distance from the nearest elevators. I loved the décor very timeless and elegant. 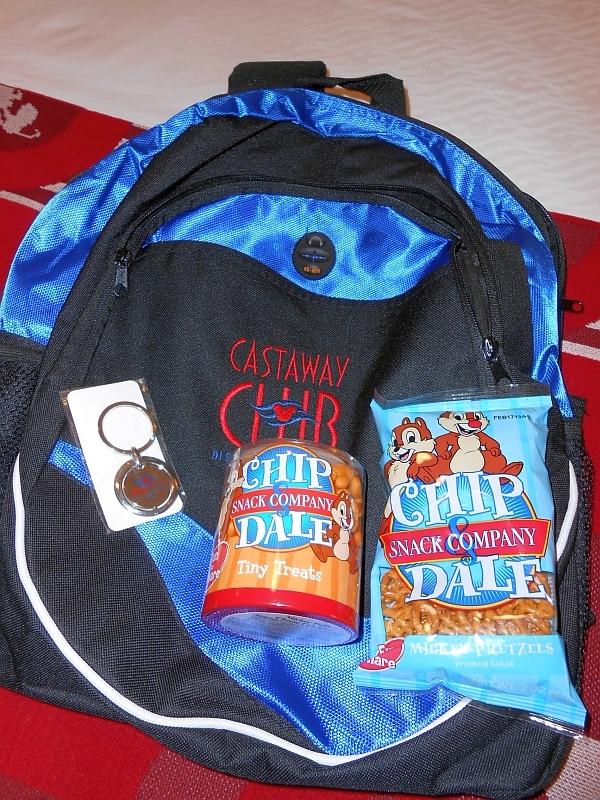 On the bed was our Castaway Club gift: a backpack with sweets, nuts and pretzels, there was also a large package from Dreams Unlimited who we booked the cruise with. We had a bag containing glow sticks (for pirate night), dry wipe magnetic board to leave messages on the door, an extension lead to plug more things in  but as this was American we gave it to a friend who was sailing on a Disney cruise in December, a highlighter pen for the navigator, a travel clock to clip on a beach bag, a deck of cards, wet wipes, sanitizer and sweets. 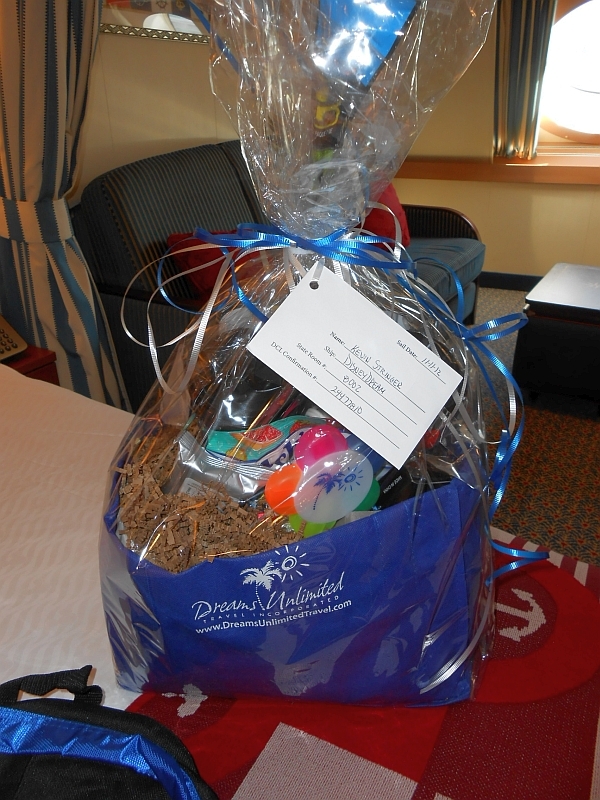 This was totally unexpected and this together with the good price we got and onboard credit meant we would definitely be using Dreams Unlimited for any future Disney cruises. 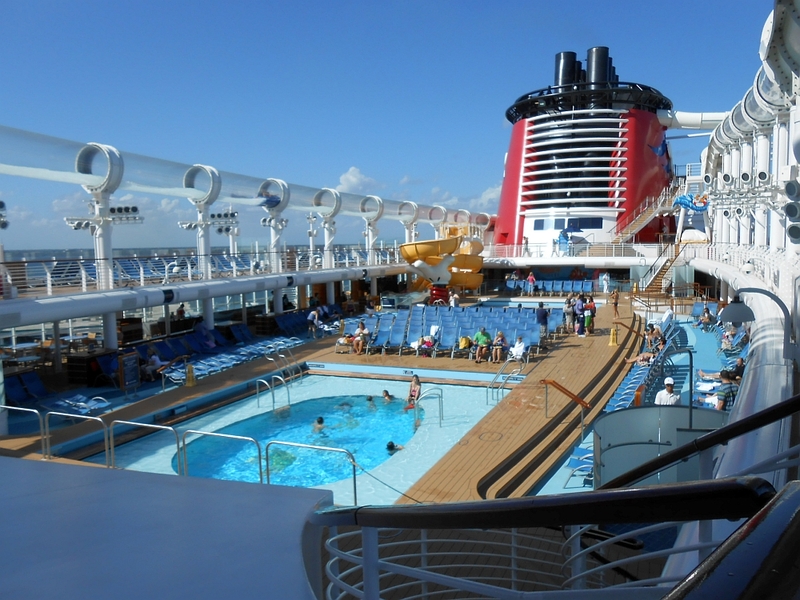 We explore the ship and end up in a bar where there is a DVC member meeting in full flow  we get a folder and some new baseball caps and listen to the spiel  our names go into the draw but we werent successful. By now it is nearly 4pm and time for lifeboat drill. Our muster station is thankfully in the theatre so nice and comfortable. There were some interesting facts about the ship  4000 passengers, 1500 crew and 150% of lifeboats required  each lifeboat could carry 270 passengers or crew. 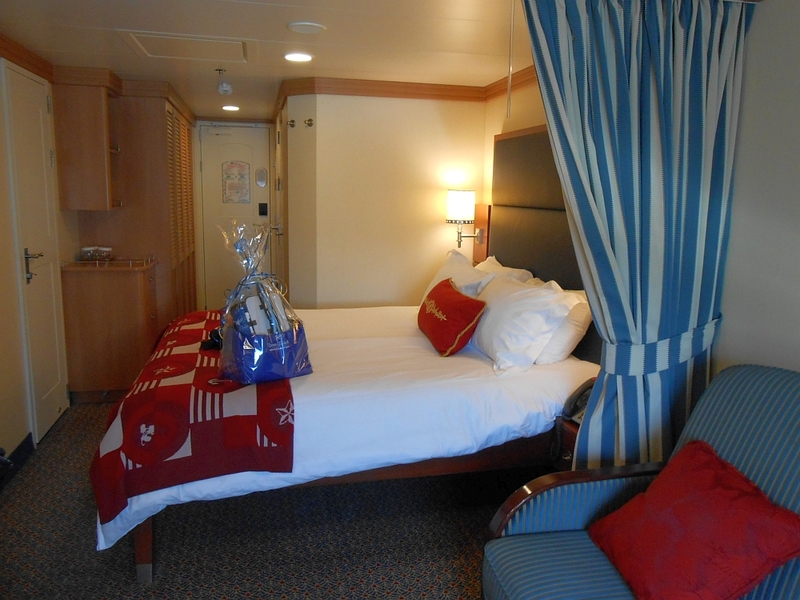 When we return to the cabins our suitcases are outside so we unpack and then go on deck for the Sail away party. At the adult only pool bar we get some drinks  unfortunately whilst we were unpacking it had rained  it had stopped but it meant the skies were grey and brooding  not the sunny sail away we had envisaged. As she gracefully sets sail we wave at the people sitting in the bars where, just yesterday, we waved at people leaving and at that point the girls had no idea we would be doing the same just 24 hours later. Go back to the cabins for the girls to finish unpacking and have a leisurely time to get ready for dinner. 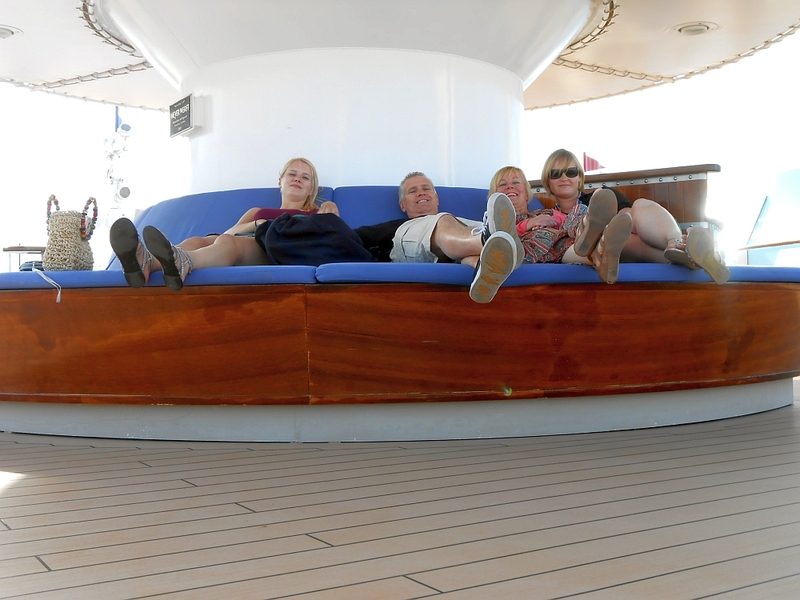 Unfortunately the wind is very breezy and the sea is a little rough  poor Georgia begins to feel queasy  we hadnt considered she might get sea sick as she was fine last cruise. Kev takes her out on deck to get some fresh air and then when I am ready I take her up to the Skyline Lounge as it has an outside deck near. 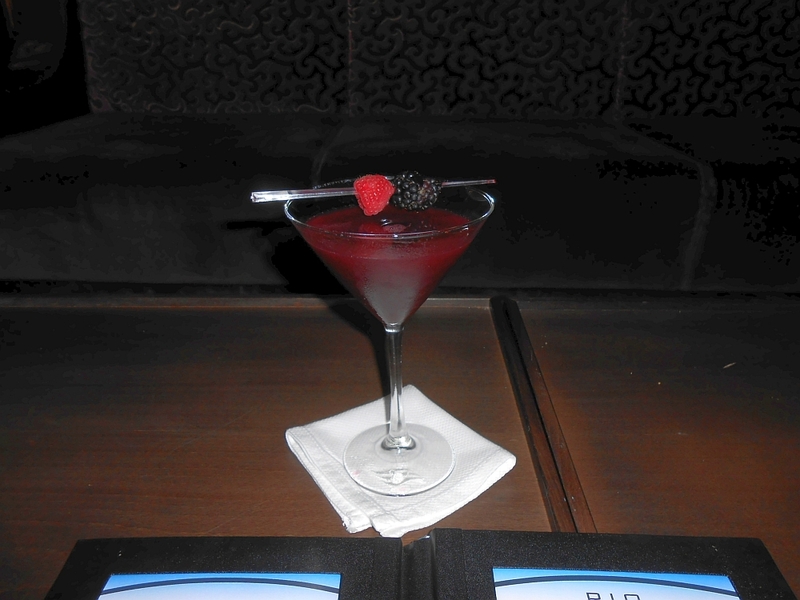 I have a 1914  Absolut Vanilla, Absolut Kurant, fresh blackberries and raspberries and sugar syrup $8.50, which is absolutely delicious. 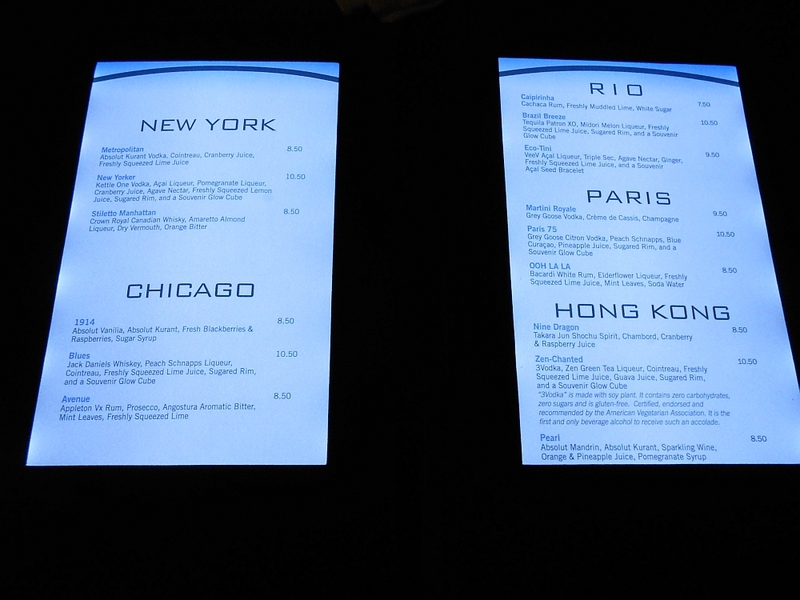 The walls behind the bar have 7 large LCD screens, which depict either New York, Chicago, Paris and Hong Kong and change periodically to a different one as well as changing from day to night as the day progresses. 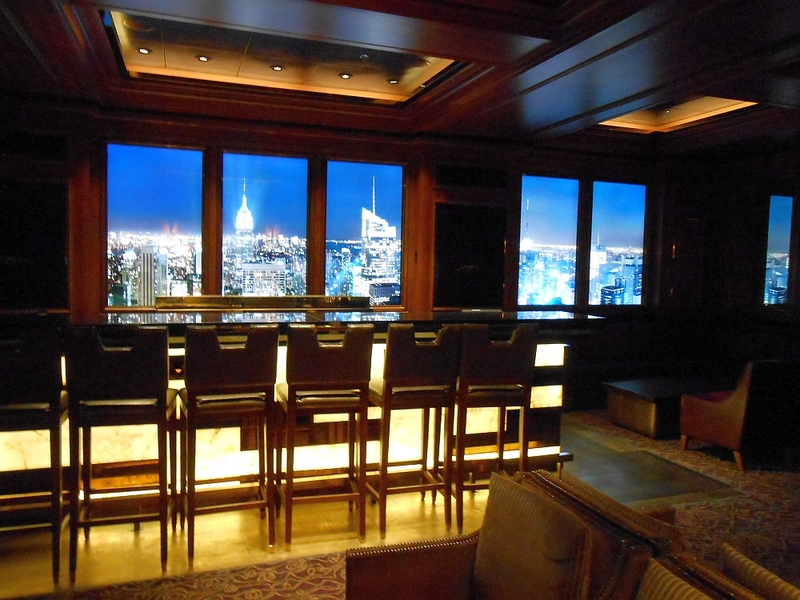 The bar man says as they change so does the music to match the city  very clever and the atmosphere is of a metropolitan sky bar in a busy city. 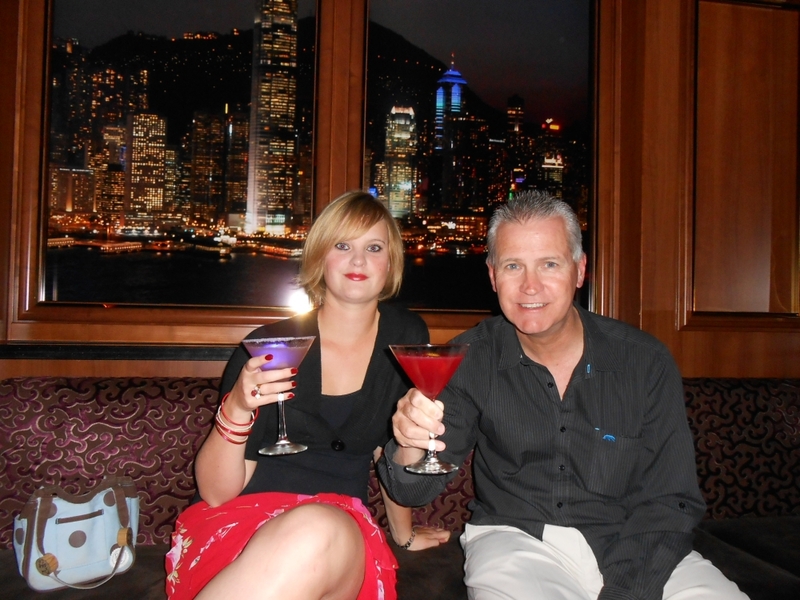 India and Kev turn up and have a cocktail however it is obvious that Georgia is really suffering  so we get some anti-seasick tablets from the lobby. At 8.15 we go to The Enchanted Garden, which is our first restaurant on our dining rotation. It is inspired by the gardens of Versailles and in the centre is a 7 ft cascading fountain. The light fittings overhead are glass flowers and there are ornamental lampposts and white trellises all adding to the feel of dining in a garden in the foothills in France. For starters Kev and I have lobster ravioli in a tomato broth, India has a mushroom brioche followed by a raspberry, gorgonzola salad, I have tomato soup and for mains Kev and India have beef tenderloin, I have chilli glazed sea bass on pea risotto. Whilst we were here we decide to book the premium wine package for 3 nights at a cost of $129. 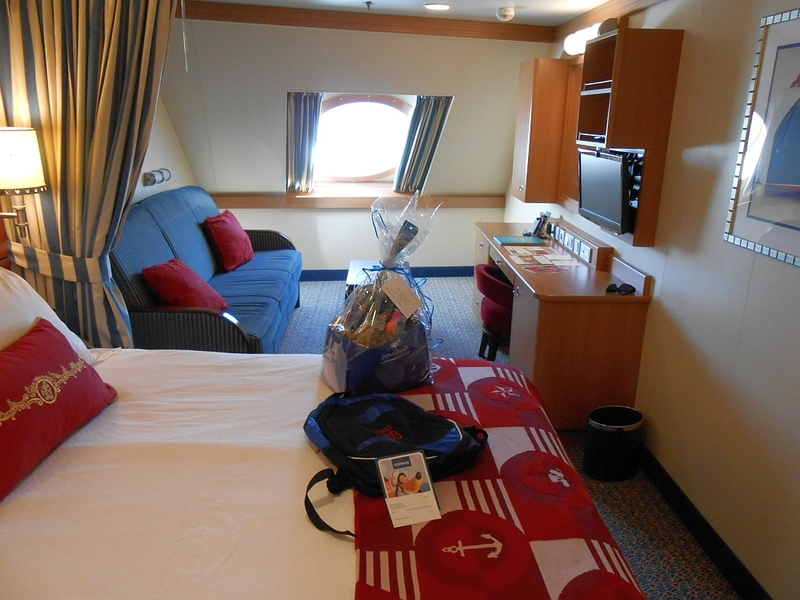 We decided not to go for the 4-night package as we were unsure whether we would be doing the wine pairings when we dined at Remys later on the cruise. The food was delicious but unfortunately poor Georgia didnt fancy anything  we were taking it in turns to take her up the 2 flights of stairs to the deck. By this time the port doors are shut because of the high winds. So we have to struggle all around the ship to find some doors to let us back in. She doesnt want to go back to the cabin as it is enclosed so we go to the Meridian Lounge, as we know there is an outside area next to it. The lovely lady waitress gave her some ginger ale but nothing did the trick and when she didnt quite make it to the side of the deck I decide to call it a night and take her back to the cabin to hopefully sleep. Kev and India head off to see what else there is to do. Georgia settles down watching Aristocats whilst I write up the trip notes and when Kev and India get back around 11ish I tell them to go back out as she is now asleep and I will stay and keep an eye on her. They tell me they went up to D lounge and were disappointed to find line dancing going on, then they found a band playing somewhere which wasnt to their liking so they ended up in Pink  the champagne bar. They were the only ones there and got chatting to the bar man who was from India and has just returned from 6 weeks at home. India had a Mango Tropicale  mango puree, maraschino liquor and champagne and Kev had an Absolutely Fabulous  raspberry puree, Benedictine and champagne  priced at $10.50  all cocktails in here are blended with champagne. They then returned to the cabin. The wind continued throughout the night and the movement of the ship was obvious and a rough night ensued.